April is the month when those first delicious tastes of spring are ready. A little asparagus, a few sticks of rhubarb, fresh new salad leaves and maybe even a radish. After a week that felt like summer, and that lured me into planting out the tomatoes, it's turned wintry. Some of the tomatoes are looking distinctly sad. I went too soon. I always do, I get fed up with watering all of the little pots every day. Usually I get away with it. This year, maybe not. I've also had a few no-shows amongst the older seeds. Packets that have been in the box for a couple of years or so have failed to germinate. So no sweet peas, not many climbing French beans, no lettuces. I shall re-sow, or maybe pick up a few sweet pea plants if I see some. This morning I spent some time digging out bindweed and horsetail. Nasty persistent weeds. They'll be back before too long I know, but for now I'm in control. I've got cucumbers, squashes and courgettes planted out as well (I know, I know). They're hanging in there at the moment, but I'm really hoping it doesn't get any colder. The new apple trees at the plot are in flower. I only planted them a few months ago, it's their first season so I'm not expecting much, but they're clearly nice healthy plants. The strawberries are in flower too, although they seem to be struggling a bit for some reason. I don't know why. Possibly something's eating the leaves. They just don't seem to be taking off. I've sown beetroot, turnips and swedes at the plot this month, and I've got sunflowers, borlotti beans, leeks and celeriac growing in pots that will be moved there eventually. There's been a bit of watering done this month after a distinct lack of April showers. I think it's all set to change soon though, so I'll be putting the watering can away. So long as it gets a bit warmer I don't mind. The loveliest part of blogging is all of the connections made. Finding people with similar passions, learning, always learning, and making friends. So I just wanted to say, thank you all for visiting here, and also for commenting. I love your comments, they make me laugh, their buoy me up when I need it and they answer questions when I have them. Comments lately have been lovely. I now have lots of tips about pocket money, some fantastic recipe ideas and a recommendation for a risque boxed set or two. I know who has red shoes, why I don't have much plum blossom and who cleans the bathroom naked (you know who you are). So thank you, it is all very much appreciated. We went for a little stroll by the canal today. Only a little one, but it was good nonetheless. A cow looked over the hedge at us. We looked back at the cow. After a few minutes all of the other cows came to see what the first cow was looking at. We all stood there looking at other and wondering what the others were thinking. Red, the most emotive of colours. Everyone knows what red stands for, it's danger, passion, anger and fire. It's in the flags of countless countries, representing blood spilled in ancient wars. And yet it's also the colour of love and passion. Visually it's the colour that jumps out at us most, because of its longest wavelength and its position at the end of the spectrum. It is the colour that raises the pulse and energises us most. It's considered lucky in China and pure in India. The red front door and the red dress speak volumes about their owners. Look at me. Look. 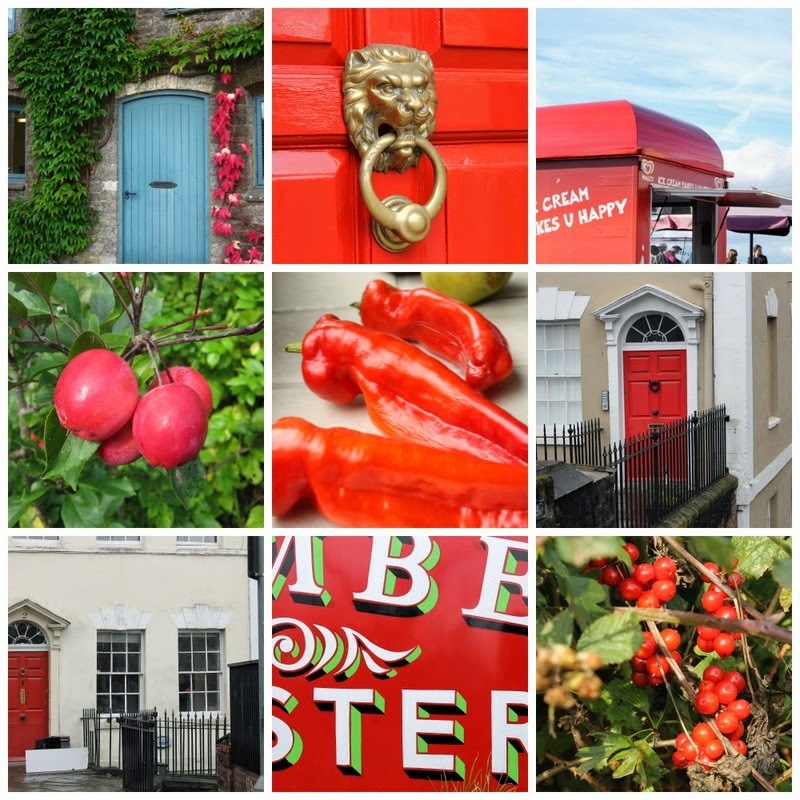 Thinking about red, and writing this post, has made me wonder whether I need a little red in my life. I can't think of any in fact. It's a colour I've avoided without even realising it. But a little something that wakes my subconscious, speeds up my metabolism, energises my thought process, it might be just what I need. I've been wondering where it should come from. It's not an easy colour to live with, or to drop into the middle of a room. Maybe a picture, maybe a scarf. A few squares of a quilt or a beaded bracelet. Just a taste to nudge my brain in the right direction. Tell me, is there red in your life? Do you find it energising and inspiring? I'd love to know. I took that last photo just an hour ago. It was such a lovely warm afternoon here, and the early evening had that wonderful still quality you get in summer. Birds singing, the sun sinking, and tranquil hazy air that just makes you stand and gaze for a while. I tried to capture it in the picture, but it didn't really translate. Maybe you need the sounds and smells as well. There's a robin in the photo, you can just make him out beyond the pond. He's been in and around the garden all day, singing his heart out. Down at the allotment there is plum blossom. A total of two whole flowers. Although the tree is young I had far more last year. I can't imagine where the blossom is. One of the pears in the garden is the same. There was a good crop last year, and this year one solitary sprig of blooms. I might have expected it of a pear, they tend to be a bit biennial, but the plum is a surprise. The picture with the river in the background is another thing I tried to capture but couldn't really. It's on the way to the plot, and the river looked quite blue and still, like a lake. You'll have to take my word for it. I picked the first of the asparagus on Friday, and we had it for lunch. Quite delicious. There'll be some more by now. And every few days from now until the summer solstice. People will be complaining by then. "Not asparagus again." But that is the beauty of seasonal eating isn't it. Eat it again and again until you can't stand it any more, then none at all for ten months. By which time you can't wait for the first exquisite taste. The tiny flowers of the gooseberry and blackcurrant are opening. Bees are abroad and also a surprising number of wasps. This is also the time of year you have to put up with an overload of apple blossom photos. I just can't help it. 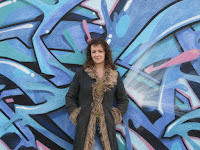 I don't photograph daffodils or snowdrops or primroses to excess. But apple blossom I can't resist. Possibly because I walk past it several times a day. Wait until the bees find it. Then you'll have bee on apple blossom. Possibly even two bees on apple blossom. The two trees I grow next to each other, in the hopes that they will cross pollinate each other, have different colour buds. The Egremont Russet is a deep bright pink. The Ribston Pippin is paler, more subtle. Oh alright, I'll shut up about it all now. Monday is my day for restoring order to the house. I dust and hoover, clean the bathroom, wash the kitchen floor, you get the drift. While I was washing the floor today there was a jaunty knock at the door. I opened it to find a government minister on my doorstep. He's our local MP, so it wasn't entirely unexpected, but nonetheless it was all quite exciting. I grilled him lightly on a couple of topics, but really all I could think was, "I listen to you on Radio 4" and "Thank goodness I washed the front door yesterday". Other half is not impressed with politicians (I'm easily impressed by just about anything) and when I told him what I'd been thinking he said something like, "Have you seen what you look like though". * What, it was cleaning day, I always wear the jumper with the hole in it and the security blanket cardigan. Five questions for you this week. Answers to any or all of them gratefully received. 1. Pocket money. A good thing? How much? Should they do chores for it? How do I stop them filling the house with plastic rubbish from China? While I'm happy for them to have a little of their own money, I really want to avoid them becoming shoppers, and seeing shopping as a pastime. Money tends to burn a hole in one or two little pockets around here. Things are bought just for the sake of it, which I hate. But maybe that is something they have to do, to learn not to. 2. How do I find more hours in the day? I know, I know, if you had the answer to that... But I really need some organisation tips. I still haven't touched the writing course, shame on me, and yesterday I found it had dust on top of it. This is not how it was supposed to be. I need more time and a little motivation. And maybe a new notebook. 3. Any good boxed set I should know about? I find it hard to find something we both like. We loved West Wing, didn't get past the first fifteen minutes of The Wire (should we persevere? ), ditto True Detective. We stopped watching Breaking Bad when it got a bit too dark (the cute child of the meth addicts finished us off). He is far fussier than me, I'm happy sewing and thinking, he needs it to be actually pretty good. We watched The Killing, but I drove him nuts by not reading the subtitles properly (I'm sewing remember) and asking what exactly was happening at regular intervals. It might be a while before he's ready for more Scandinavian drama. We only watch for about 20-30 minutes at a time, last thing at night, just to calm the brain patterns and turn off the thoughts a bit. If it's something scary (we watched Criminal Minds for a while) we make very sure the doors are locked when we go up. We're trying The Good Wife at the moment, but it's a bit too girly and naff for him. 4. Do you have a favourite quick recipe you'd care to share? I struggle to find something everyone likes and quite often I end up adapting things so that someone can have it meat-free, someone can have it cheese-free. So something that can be done in two different ways would be ideal. 5. One for the gardeners amongst you. Is it too early to plant out courgettes and squashes? This is the time of year that all of the seedlings on the windowsills start to drive me nuts. They're so demanding! The garden centre has courgettes outside under a roof, but open to the cold winds. Although what the garden centre does doesn't always fill me with confidence. I struggle to find actual garden items there sometimes, and the other days I got caught up in an area of tightly packed patio furniture and dropped my weed-proof membrane and my seed packets while trying to squeeze through. It was like something from a Greek myth, where you're sunk deep in the middle of it before you even realise and then there's no way out. Anyway, I'm very tempted to take a few little things to the allotment today and set them free. This warm weather is very seductive isn't it. No doubt I shall live to regret it. In fact I think I heard something about gale force winds this weekend. Not here though surely..? I didn't get the level of clothes right at all this weekend. At yesterday morning's football I froze in a thin coat, lulled into a false sense of security by last week's summer temperatures. I had no thick coat, no scarf, no gloves, no flask of hot cocoa - all of my things to keep me warm. The pitch was incredibly exposed, the wind was fierce, the game was mediocre - nothing to warm me up there. Sometimes a lively game, with how shall I put it, vocal opposing crowd, can warm a person right through. I took the smaller brothers too. They disappeared from sight at one stage which did raise my pulse rate slightly. I found them up a tree. Of course. Today we went for a walk up and down the valley near Nailsworth. It's a steep sided valley, with houses tucked tightly into its slopes and vertiginous terraced gardens. The path meandered between the houses. As you walked past one front door you were simultaneously level with bedroom windows and roofs of the cottages below. I loved it, but I imagine it can be dark and damp in the winter. Little flat areas of outside space were cleverly made the most of. A greenhouse slotted in here, a wrought iron table and a couple of chairs fitted in there. I wore my thick coat with the fur lining, a scarf, a jumper, I had gloves in my pocket, an umbrella in my bag and a big flask of steaming cocoa. My, it was hot. This is the joy of an English spring though isn't it. You never know exactly what to expect. Glorious days interspersed with biting winds and driving rain. Blossom against a deep blue sky, or clinging to a branch as the storm rips at petals. It's back to school tomorrow for the children. I have an idea to be more organised about things. I need to make more hours in my day. Maybe I should plan meals in advance. Make a note of the things to be done on each day. I finally took the plunge and got the writing course I was talking about - in February. It's sat on the shelf and I've hardly looked at it. I hate the fact that I haven't made time for it. I'm not that sort of person really. But I always seem to have other things to do. Prevaricating? I don't know. The bullet needs to be bitten. Tomorrow. Or maybe Tuesday, tomorrow I need to restore order to the post-holiday house. We had a little holiday treat in a canoe yesterday. We did surprisingly well at zipping along, although there were a few moments where the person at the back (that would be me) was dragged through a tree or into brambles. I ended up with yellow pollen streaks down my face from catkins. Otherwise fairly unscathed, all things considered. There was a duck with nine little ducklings. A male mallard was chasing the mother duck all over the place, really aggressively. You can see him in the picture. The little ducks were desperately zooming after her. He left them alone in the end. Maybe they were in his patch. I've been sowing a few things in the garden. It almost feels like summer after all. We've pulled the last of the leeks and planted the first of the lettuces. The weeds are up and the windowsills are full to bursting. 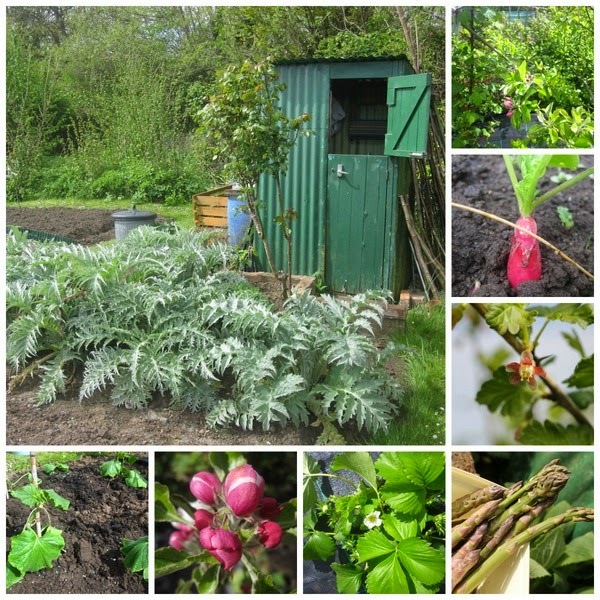 It's the time of year when the garden and the allotment can start to feel overwhelming. I have to remind myself to calm down and tackle it a bit at a time. Lots of deep breathing. I fell down the stairs this morning. No sympathy necessary, I'm used to it, you'll recall how clumsy I am. Later on I had an incident with some pizza dough. I think I must had misread the recipe. It was huge and really really sticky. It was stuck to absolutely everything, I couldn't do anything with it. I'd have taken a photo for you but I couldn't get it off my hands. Then I knocked an oil bottle off of the counter and somehow the drizzly bit at the top broke a bit and got pushed all the way down into the oil bottle. These things come in threes, so I was hoping that the pizza dough disaster counted as a thing, so that was my three. But then when I was washing up after tea I dropped my flan dish and it broke into two. So that is definitely three things. Unless of course the pizza dough does count, in which case the flan dish will be the start of the next three things. I'm moving cautiously. And I'm thinking about starting a tag for posts about clumsiness and disasters. Wishing you all a lovely weekend, full of sunshine and good things.